Abbie Weeks is one of the Solar Team members from Denver, CO who installed 6 (330-watt) PV panels on the roof of NVSS' Biology and Computer Lab building last month. Thanks to Cherry Creek High School's EcologicalAction organization, students now have access to direct generated and stored electricity in the lab. 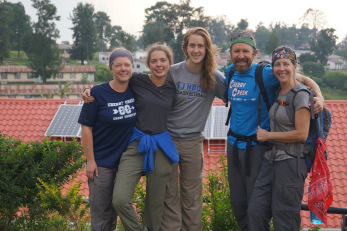 We are so thankful for these five volunteers who traveled so far, with so much equipment, to install a working solar array and educate everyone around them. They truly shined with sunlight everywhere they went. Please read Abbie's latest blog which reflected on her trip, this project, and what it signifies globally. There are 14 additional blog entries on the EcologicalAction website about Nyaka - all inspiring reads! I have been back in the United States for two weeks now and have had time to reflect upon our whirlwind journey in Uganda. First, I feel deep gratitude for the hundreds of people who have somehow been involved in this near year long process, from EcologicalAction’s first meeting of the 2015-2016 school year to the moment our plane’s wheels touched back on U.S. soil. I never would have imagined that the club I started Sophomore year would find its way to Nyakagezi, Uganda. 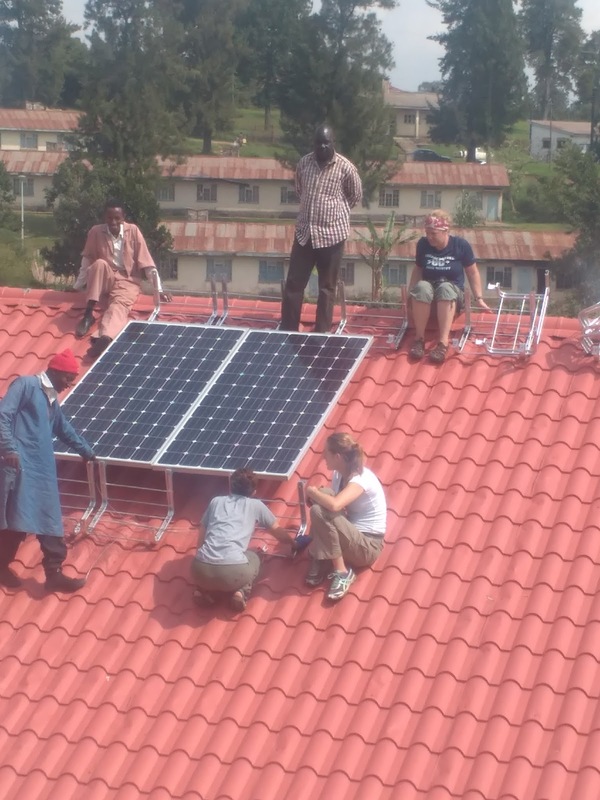 Believe me, I understand that if the universe were a tapestry, our project to install solar panels on two buildings of the Nyaka AIDS Orphans Project would be just a single, tiny thread. Yet that thread is interwoven with the lives and experiences and guidance of so many organizations and individuals: Nyaka staff both in Kampala and in the field, every student and teacher at Nyaka Secondary Vocational School, Cherry Creek High School Administration, attendees and musicians at our benefit concert, 7th Grade teachers and students at West Middle School who participated in the Nyaka Walk, my supportive teacher and mentor Mr. Dufford, our families, 9News, EcoTech Institute, The Villager, and airport personnel as mentioned in a previous blog post. We are just a fragment of life’s greater tapestry, but we span continents. Albert, a former Nyaka student and budding solar electrician! Amy Weeks, teacher Ngabirano Junancea and Amy Boyce Lauren McMillen and NVSS students. Amy Weeks and Bwengye Benon give Albert a hand. Samuel Mugisha astonished at the changes! Lauren and Albert Abbie, Albert the Student!, and Lauren figuring it all out! Local electrician Albert and Jeff Boyce saying good-bye. Environmental Activism has slowly grown to engulf and inform my life. This experience, however, challenged my preconceived notions. My awe and wonder has always lain with the natural world and I deeply feel a desire, no responsibility, as a citizen of Earth, to halt and reverse our species’ degradation of our ecosystems and biodiversity. Additionally, as a species we have an obligation to each other: to ensure the human rights of all are fulfilled. “Recognition of the inherent dignity and of the equal and inalienable rights of all members of the human family is the foundation of freedom, justice and peace in the world” (UN Universal Declaration of Human Rights).